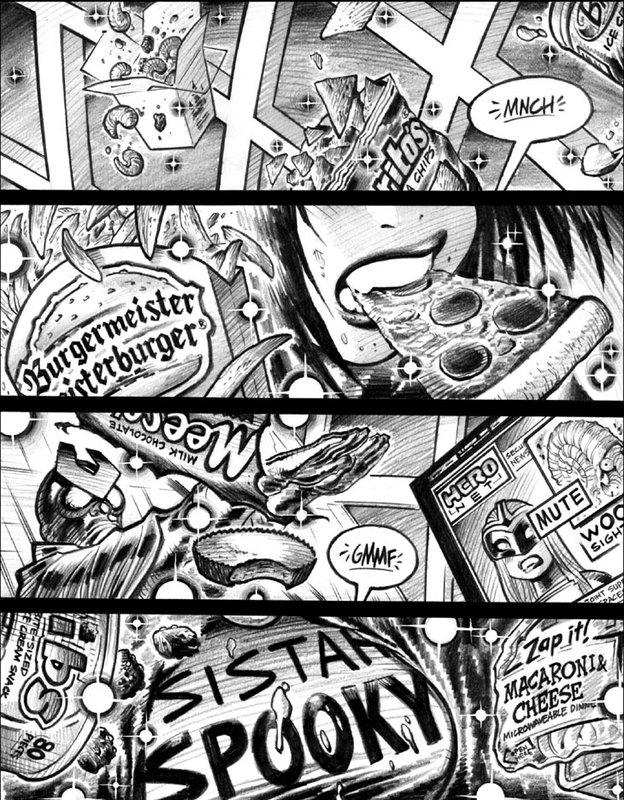 Panel 2: I quite like the “Burgermeister Meisterburger” fast-food joke, which might be a familiar Christmas-season reference. Why, the lettering for the logo’s not too shabby, either! I only belatedly noticed that Spooky is biting down on that piece of pizza in a rather peculiar manner, pulling her lips back for some unknown reason. No, in fact the reason is fairly clear: I only rarely depict characters eating, which can be a surprisingly tricky drawing challenge. Panel 3: Might that foreground figure at left look familiar from this volume’s cover? Perhaps! At right, the screen with “HeroNet” running represents the first appearance of a significant and long-running Empowered riff, one that I’ll blather about at length in future commentaries.